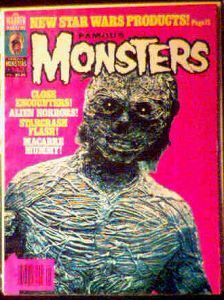 May 1978 issue of FM with featture on Karloff's Mummy. Mint condition. Most Mummy movies were pretty stupid. I mean, unless you were an invalid, anybody can out-run a mummy. He practically had to back his victims into a corner in order to kill them. But Karloff's original Mummy was a classic and is still very good thanks to Boris and Jack Pierce's classic make-up job. Website design and hosting by Sohodojo Business Services. Item 120 of 466 items displayed in viewer. 0 items in cart.